You may not have an entire room where you can get away but a retreat is still within reach. You may not have an entire room where you can get away for crafts, meditation or a catnap, but a retreat is still within reach. Having a room of one’s own is an appealing idea — a space just for you, where you can read, journal, craft, do yoga or simply relax, away from the bustle of a busy house. But even if you don’t have an entire room to spare, carving out a special corner designed for you and you alone is something doable. Rev up your inspiration with these 10 creative corners, from reading nooks to hammock hangouts. Tea garden. Carry your tea and a treat outdoors to enjoy in the fresh air for a delightful change of pace. 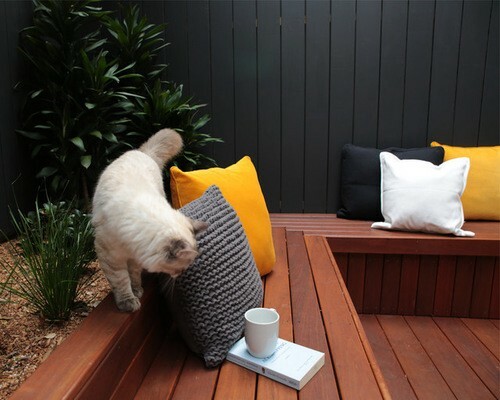 Essentials for a tea garden include a place to sit and set down your tea, and lush plants (in pots or planters is fine). With a tea garden, small can be considered a virtue — look for a private corner of the garden, or revamp a small side yard or patio. Add a wall fountain or wind chimes for ambiance and a few plump cushions for comfort. If you’re concerned about keeping your cushions clean and dry, store a few indoors (a storage bench makes an ideal spot) and take them with you when you venture out. Reading nook. Set up a cozy corner for diving into that new book by arranging a comfortable armchair and footstool, a reading lamp and a table for setting down your drink and book. Next to a window where you can read by natural light during the day is ideal. A bookcase nearby for choosing your next read and a soft throw to wrap up in on chilly days will complete the scene. Napping porch. A sun porch makes a wonderful spot for a catnap. Position a daybed for maximum sunlight and plump it up with a feather mattress and plenty of cushions. Adding green plants all around will help clean the air and add to the relaxing vibe, while a rattan stool can keep a stack of magazines or a mug within easy reach if you’re not feeling sleepy. Hammock hangout. Relax in your own private backyard retreat with a fringed hammock and quiet seating area. Weathered finds in wood and wrought iron will lend an earthy feel to the space. If your outdoor space is a patio, you can still bring in greenery in the form of potted dwarf trees and mossy ground cover planted between stones. Meditation corner. If you want to start carving out more time for meditation, one good way to begin is by earmarking a corner in your home as a meditation zone. Clear away clutter (and dust) and place a few floor cushions within reach. If you like, add a statue, candle, bell or a stack of inspiring books. Creative work zone. Whether you’re a writer, crafter or artist, having a dedicated space to pursue your art is essential. A simple desk by a window with a bit of shelving nearby, along with good light, is all you really need. Keep the tools of your trade on display — it’s convenient as well as inspiring. Guest bed getaway. If you have a guest room, it can feel like a waste of precious space between visits. Instead of letting it go unused, why not think of it as your own mini getaway? Put fresh sheets and extra pillows on the bed, hang a vintage painting and add a comfy chair. Treat yourself to a nap or an afternoon of reading and journal writing from your private lair. Yoga shed. Sure, you can roll out a yoga mat just about anywhere, but having a special spot dedicated to your practice can actually make it more likely that you’ll use that mat. Here, a tiny backyard shed was transformed into a yoga studio for one, but you could create the same feeling in a corner of a master bedroom. A rug defines the area and provides extra cushioning beneath your mat. Store blocks and other props nearby and add a few inspiring details like potted plants and candles. Window seat. Positioned to take in the view, a window seat makes the perfect perch for reading, napping or simply daydreaming. Put your feet up and let your mind wander — and store a blanket nearby in case you start to drift off. Thinking chair. A swinging or rocking chair placed in a peaceful corner of the home is a wonderful spot to sit and think through things that have been on your mind. If something has been worrying you, purposely sit down in your “thinking chair” to consider the problem, and consciously let it go when you get up.